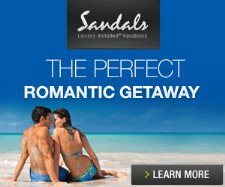 Sandals Negril Resort Sundowner Pool is located next to the Piano Bar overlooking the beach and ocean. The Sundowner Pool features a quiter and more relaxed atmosphere compared to the main pool. Some guests will simply relax in this pool while enjoying the sunset. The Sundowner pool is located next to the piano bar and features a deck overlooking the ocean. The Sundowner pool deck area.